For over 25 years the study of retroviruses has underpinned much of what is known about information transfer in cells and the genetic and biochemical mechanisms that underlie cell growth and cancer induction. Emergent diseases such as AIDS and adult T-cell lymphoma have widened even further the community of investigators directly concerned with retroviruses, a development that has highlighted the need for an integrated understanding of their biology and their unique association with host genomes. This remarkable volume satisfies that need. Written by a group of the field's most distinguished investigators, rigorously edited to provide a seamless narrative, and elegantly designed for clarity and readability, this book is an instant classic that demands attention from scientists and physicians studying retroviruses and the disorders in which they play a role. "With the arrival of Retroviruses, a worthy successor to the 1985 classic has finally appeared. Despite its downsized title everything about this volume, edited by John Coffin, Stephen Hughes, and Harold Varmus, is top notch. Especially noteworthy are the many superb illustrations, which include color diagrams of protein structures, molecular mechanisms, and other aspects of retroviruses and their effects."
. My copy disappeared from my office the day it arrived. Better order two copies at once." 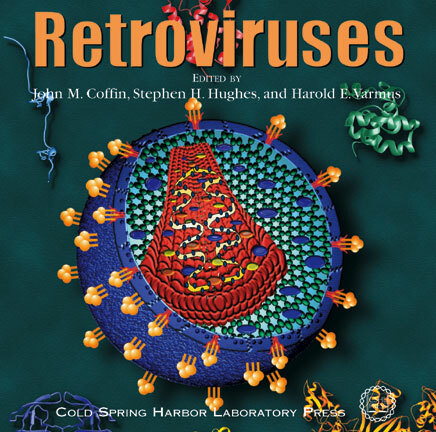 "Retroviruses is an outstanding reference book for clinicians and medical students who want to deepen their understanding of retrovirology, and it is a definite must for basic scientists working the field." the book satisfies the needs of a very wide scientific audience, serving as an invaluable reference book for even the most fanatical afficianado; as a complete textbook for teachers and students of retrovirology; and as a user-friendly entré into this field for the naive reader. Simply put, Retroviruses has set a new benchmark against which all future virology textbooks will be judged."